Postcard-perfect Amsterdam First stop was Amsterdam, the capital city of Netherlands. 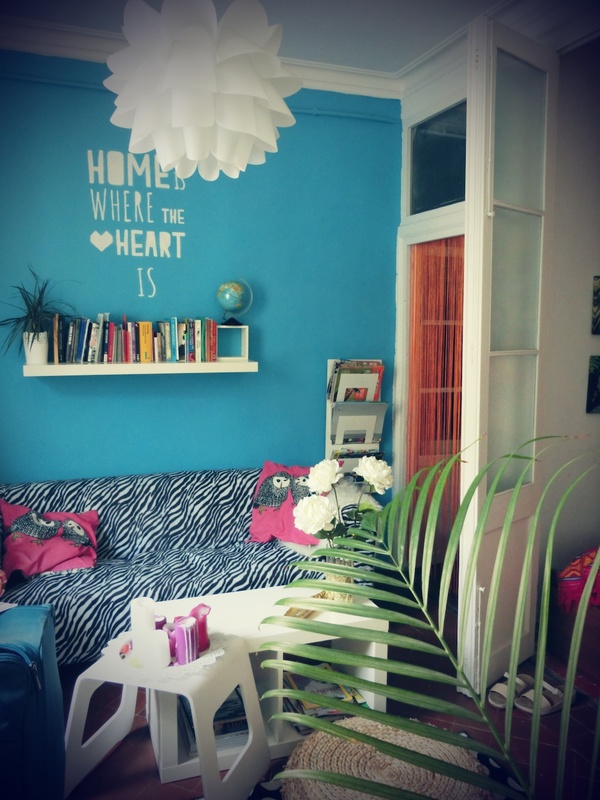 An apartment in the Jordaan Quarter was going to be our home for the first 5 days of our trip. 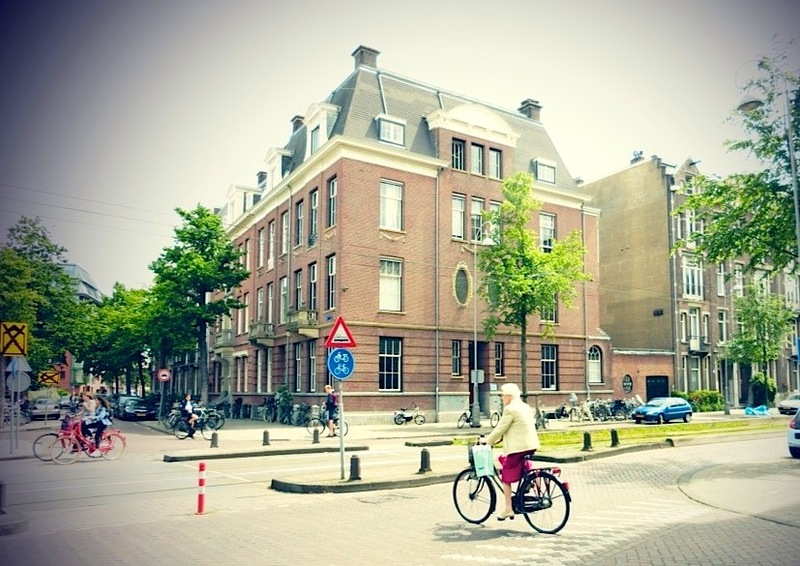 Formerly a working class neighborhood, Jordaan is now home to young professionals and small businesses, with charming little shops, art galleries and brown cafes. Located west of the city centre, it’s a beautiful maze of narrow streets and picturesque canal bridges where one can gladly get lost in. Every day we walked through this maze and headed south to the Museum Quarter and Vondelpark , and on some days, east to the Central Station area where most canal cruises start from. I made sure to visit the Van Gogh Museum and Rijkmusuem, while my friends skipped Rijks for the Heineken tour. I could hardly contain myself looking at Van Gogh’s original works, after staring at their reproductions hung on my bedside wall for many years. My fascination with Van Gogh and other impressionist painters began many summers ago when my brother and I took up summer art class. I love the thick, spontaneous brushwork, the use of bold colors, the unconventional composition, and the varied themes. I like how their paintings look like muddled colors, lines and shapes when viewed up close, but take a few steps back, and they transform into an entirely different scene or portrait. Equally moving yet somber was our visit to the Anne Frank House. They have recreated most of the rooms, as described in the book, and provide back stories about the family members as well as the “helpers.” Hearing these stories through the audio guide made it more absorbing. 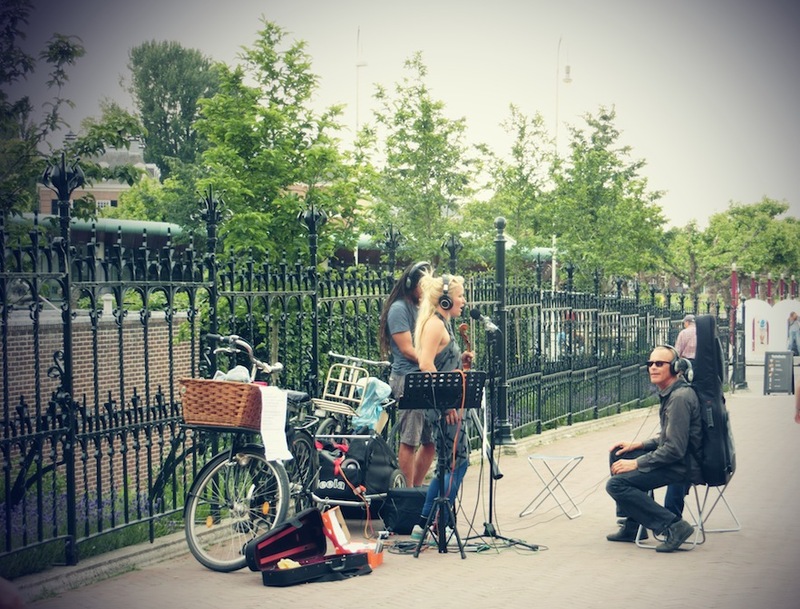 An amazing fact about living in Amsterdam, or Holland in general, is the bike culture. Almost everyone cycles to work, to meetings, to school, to dinner dates, to practically everywhere! Grannies and grandpas, moms with toddlers, dads with kids, teenagers, young kids, they all take their cruisers up and down the bridges, through the main roads, past narrow alleys, and through the countryside. The bike lanes are the most organized I’ve seen, some are even cobbled and painted in red. The bicycle flat near the Central Station is hard to miss, with hundreds of bikes parked on its three decks. The facility, built over water, can fit2500 bicycles, and the city has been looking into building underwater parking facilities! 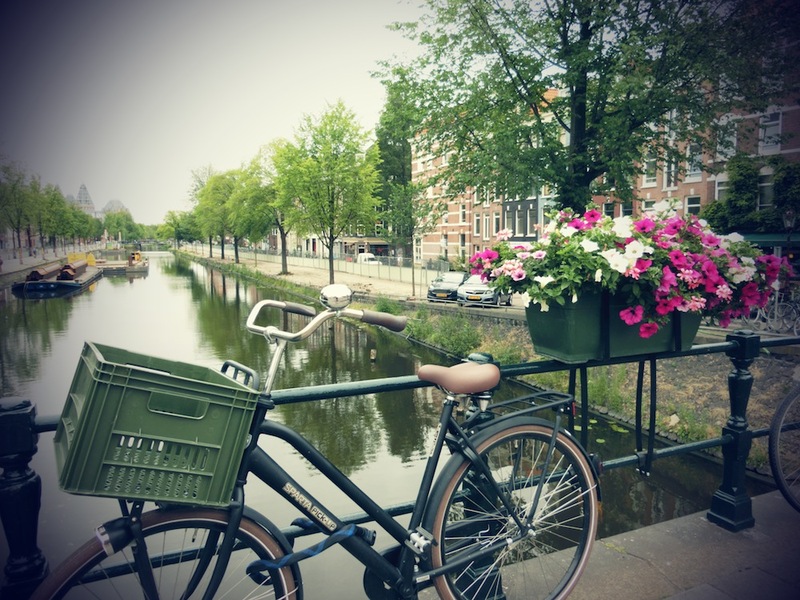 Cherry and I went on a half day bike tour to the countryside and cycled past sheep farms, open fields, houseboats, houses next to canals, and Dutch families going about their Sunday chores. By chance, we walked in the middle of a town fair in full swing, with our cruisers in tow of course. Cycling is a necessity as much as a passion here. It makes me wish harder for my hometown Dumaguete to put up bike lanes, and promote a similar lifestyle, fitting to our seaside university town. 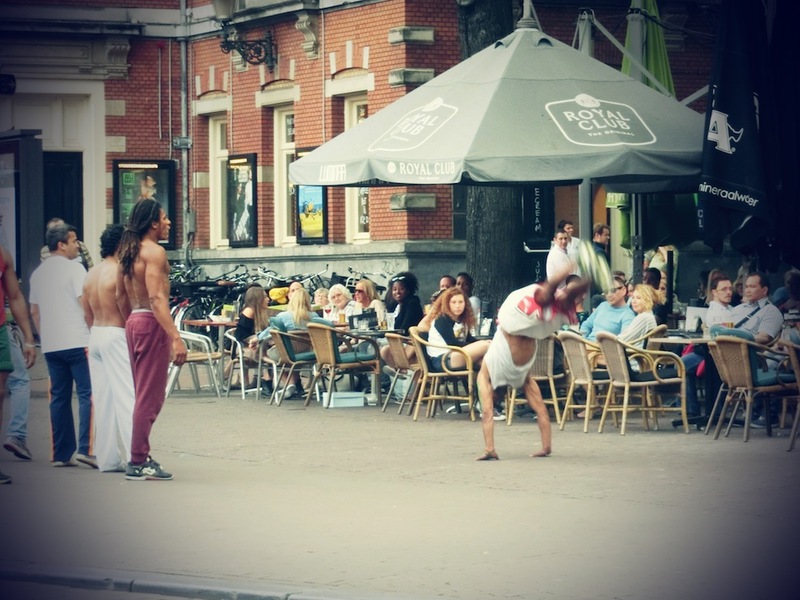 In Amsterdam, one must not confuse coffeeshops with cafes. While the latter mean bars or pubs, coffeeshops are those that are allowed to sell cannabis in small quantities, but prohibited from selling alcohol. There are also smartshops that sell mushrooms and herbal energy drinks, and growshops that carry cannabis seeds. We skipped the smartshop, but made our way to the coffeeshop, where the guy behind the counter gamely showed us a menu of the different strains of marijuana and hashish. Trippy night it was. 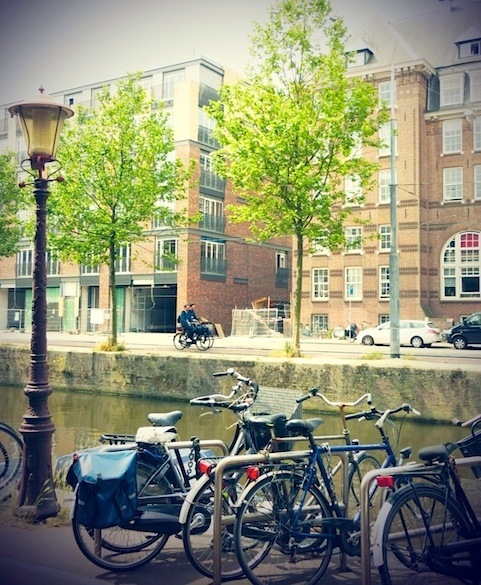 I found it amusing that while smoking pot is allowed only inside coffeeshops and homes, we caught the familiar whiff almost everywhere–by the canals, the parks, and sidestreets. Like New York’s Central Park, Amsterdam has Vondelpark, its most popular park that covers 47 hectares of trees, grass, rosebushes and ponds. 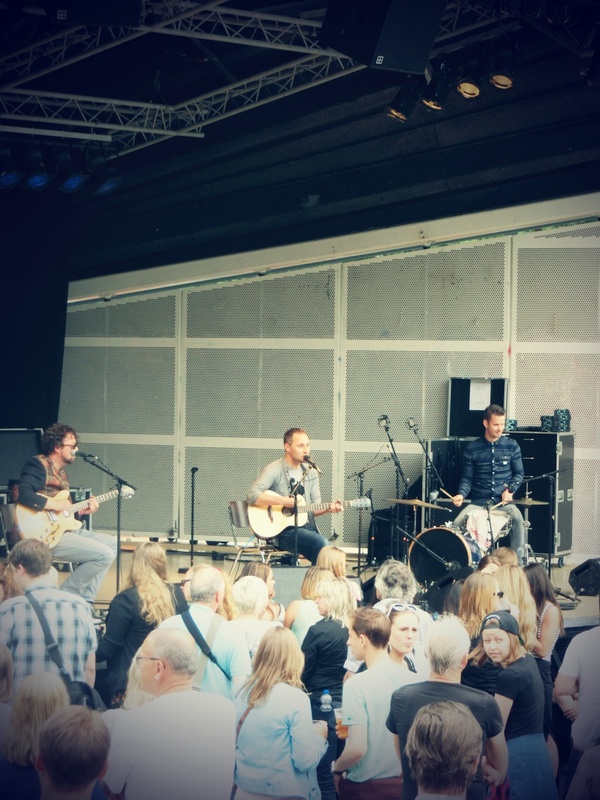 While waiting for a friend from Rotterdam, I caught some local bands at the Open Air Theatre, a common event during the summer. The crowd was a mix of locals and tourists, out for some good music (free), and some Heineken (not free). Hip and Radical Berlin On our fifth day, we packed our bags and boarded the ICE train to the eastern part of Germany. 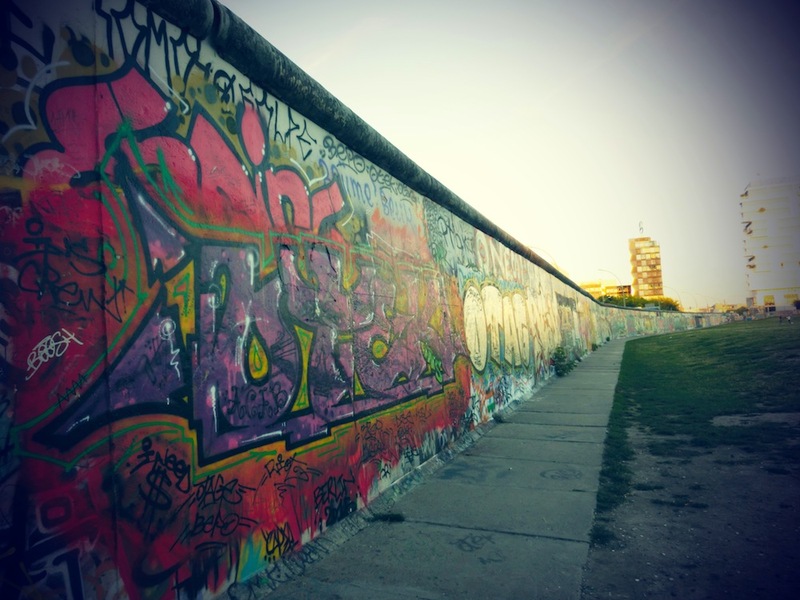 Berlin was like a jolt to the senses, after Amsterdam’s postcard perfect sceneries. Its energy and atmosphere radically different. 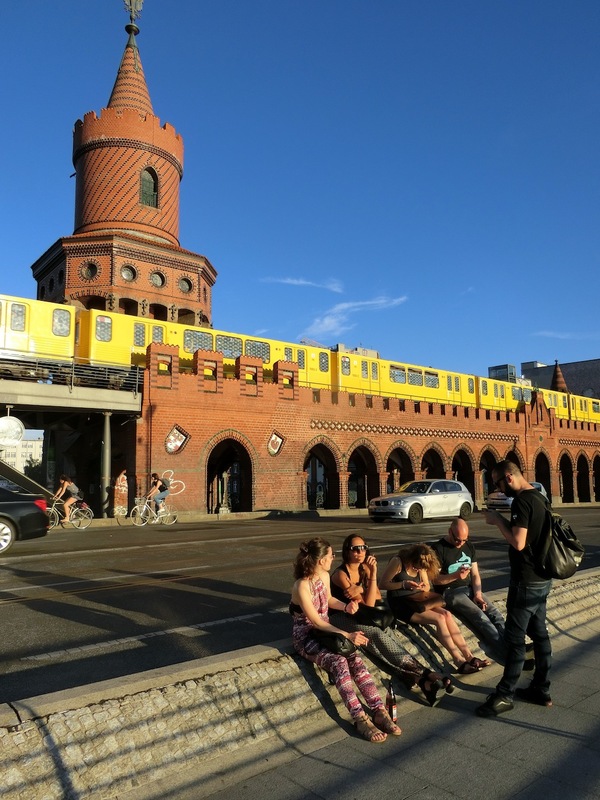 From the Berlin Hbf Central Station, we took a cab to our apartment in Kreuzberg, a neighborhood with an eclectic mix of immigrants, mostly Turkish, and ‘counterculture artists and activists.’ The bohemian and punk rock vibe was evident in the restaurants, clubs, food carts and galleries, that was often filled with locals enjoying the extended daylight of summer. Imagine sunsets as late as nine in the evening. Our apartment was a 15 minute walk to the metro station, and along the way, we would pass by a tree-lined sidewalk, a quiet cafe in a basement room, an Apotheke at the corner that looked more like a cosmetics shop than a pharmacy, an always packed alfresco Italian restaurant, and a dainty Gelato shop. 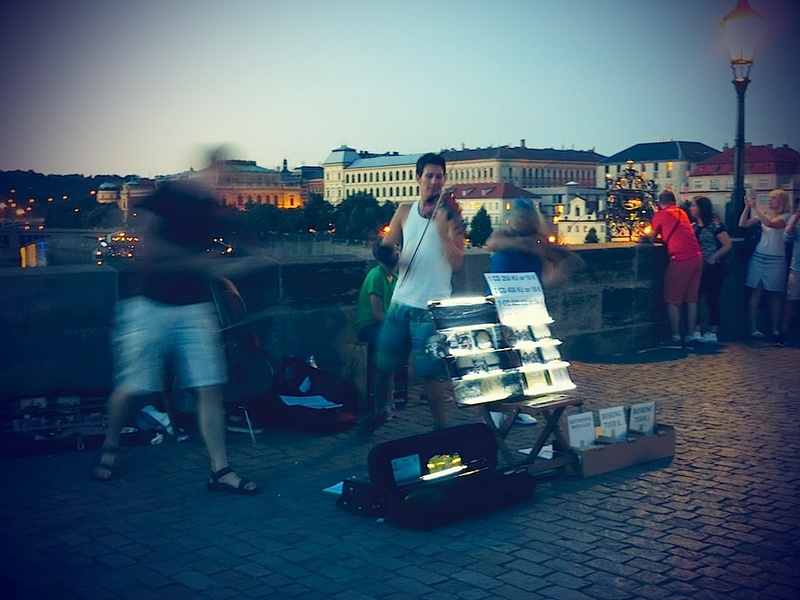 Halfway to the metro was a bridge where most would be sitting on the pavement talking and drinking, some huddled in a group in animated discussion, and in one end, two guys jamming with a violin and guitar. 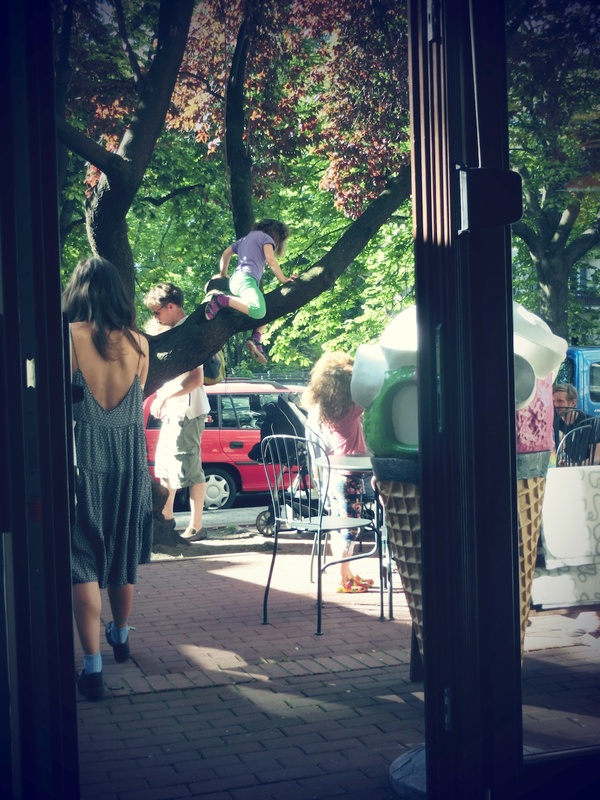 This was a typical summer afternoon in Kreuzberg, and maybe in any suburb in Berlin. Past the bridge, we would walk by more apartment buildings painted with graffiti, a popular shawarma bistro that stayed open late at night, and a busy grocery store (where we got our supplies for breakfast). 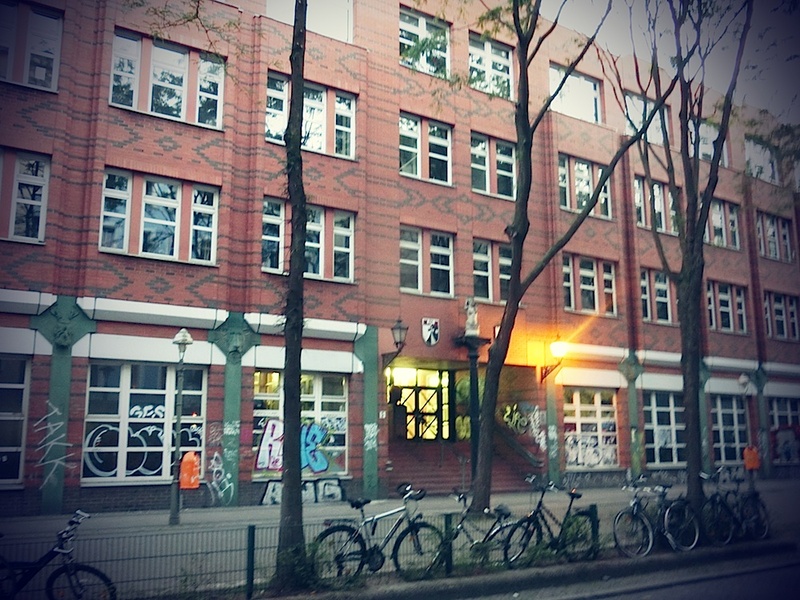 During these walks, I felt like a Berliner even for just three days. Visiting the Memorial to the Murdered Jews of Europe and its Information Center was poignant. 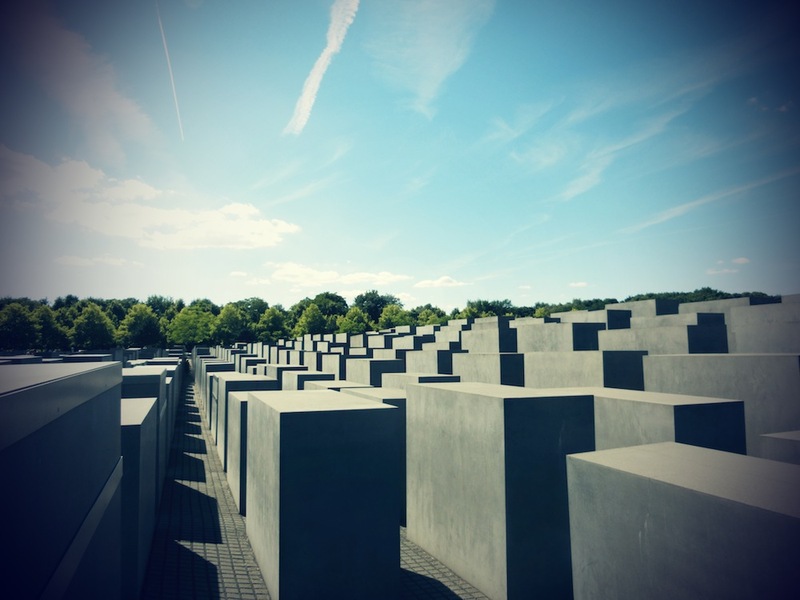 Designed by Peter Eisenmann, an American architect, the memorial covers an area of 9,000 square meters with 2711 concrete blocks in varying sizes. While the blocks are arranged in a symmetrical way forming a maze, they have different heights creating a strange play of shadows. If you walk between the blocks, on the uneven ground, the feeling is unsettling. Visitors are free to form their own interpretations. One striking interpretation shared by my bike tour guide the next day was that the unequal height and uneven base of the blocks from street level symbolized how the Jews felt–uneasy, chaotic, troubling, but when viewed from above, all the blocks are spaced symmetrically and shaped uniformly, symbolizing the perspective from the top, the government, that everything was planned and in fact, had order. We went down to the Information Centre located underground where a deeply compelling exhibition on the Holocaust occupied several rooms, displaying personal accounts of several families who survived and who did not survive this horrific period. The next day I took a bike tour on the Third Reich and Nazi Germany, hoping to understand how such atrocities could happen. Our guide traced the root of Anti Semitism, and how this evolved into the extreme monstrosity of the Holocaust, while showing us the air raid shelters and bunkers. 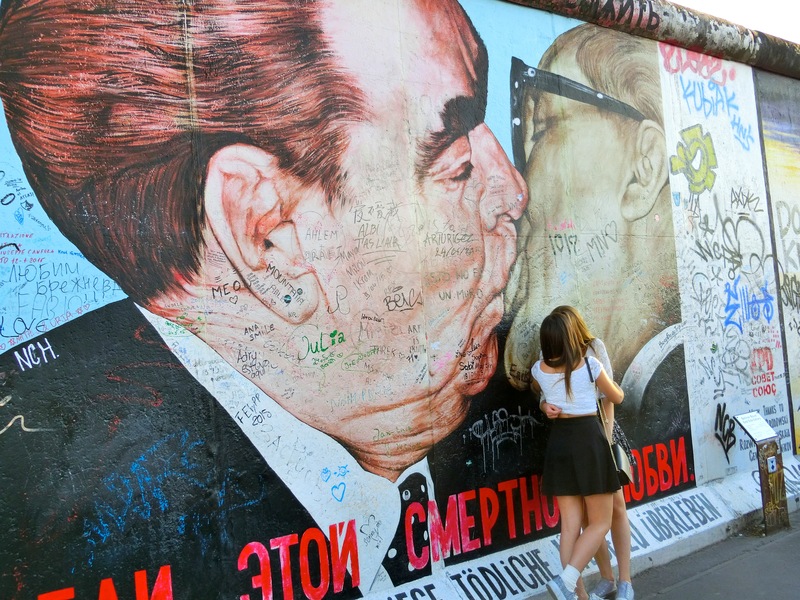 While the Holocaust memorial and Third Reich tour left me heavyhearted, walking the length of the East Side Gallery was exhilarating and a visual delight. 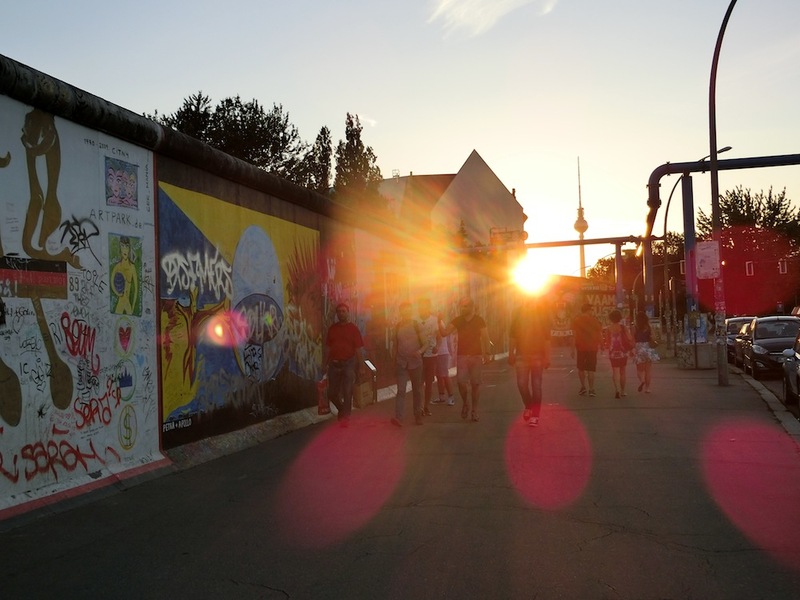 The 1.3km section of the Berlin Wall is filled with a hundred murals by artists from over 20 countries. 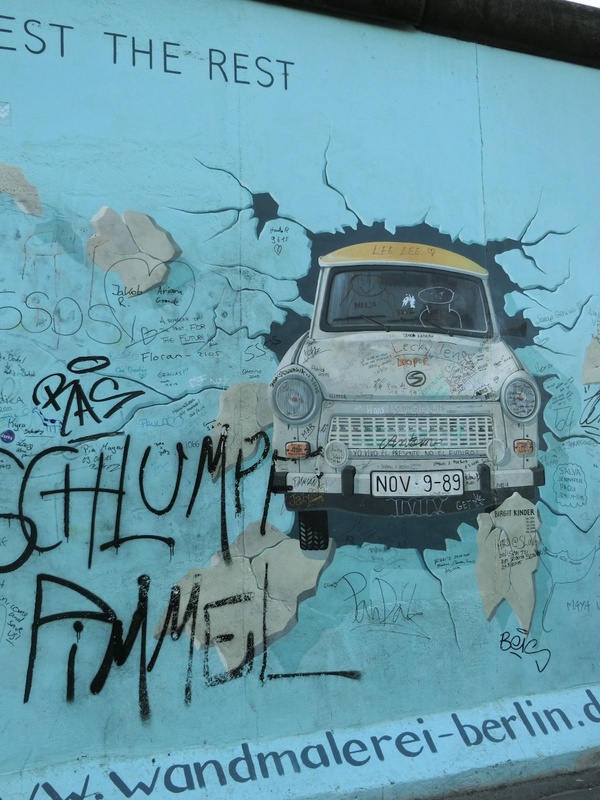 The murals depict diverse symbolism and creative interpretations of the events surrounding the fall of the Berlin Wall in 1989, and the events after. To be right in the middle of the biggest open air gallery that celebrated freedom gave me an intense rush of excitement. 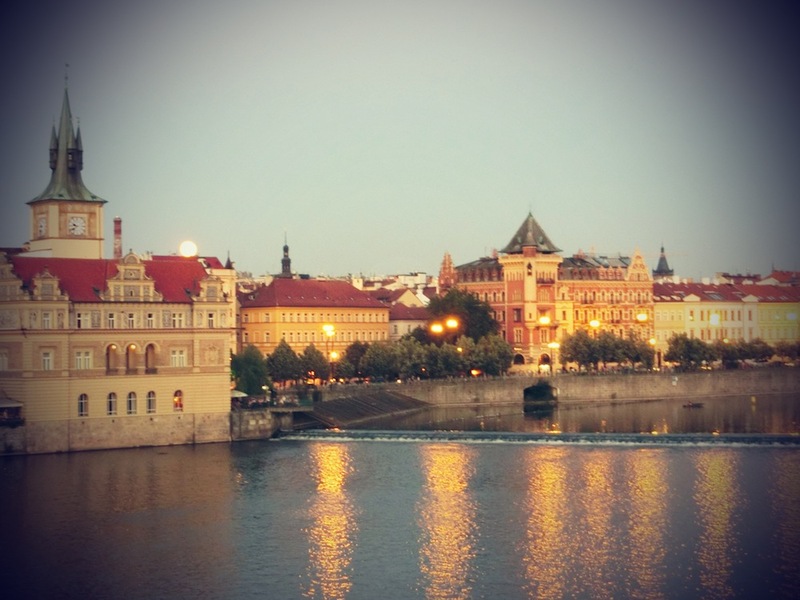 Moonrise viewed from the Charles Bridge. Moving southeast, we took the DB Bahn EC train to Czech Republic. Since reading books by Czech writers, and books about Prague, I’ve always had this idyllic, almost magical picture of the Charles Bridge, the old buildings and the bohemian lifestyle of the Czechs. 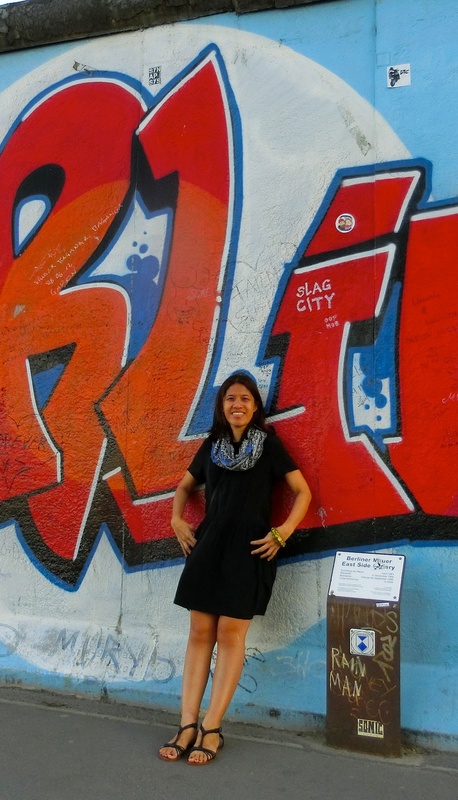 Two days before, I had booked the Prague History and Bohemian Culture Tour, while Ann picked a City Sightseeing Tour. 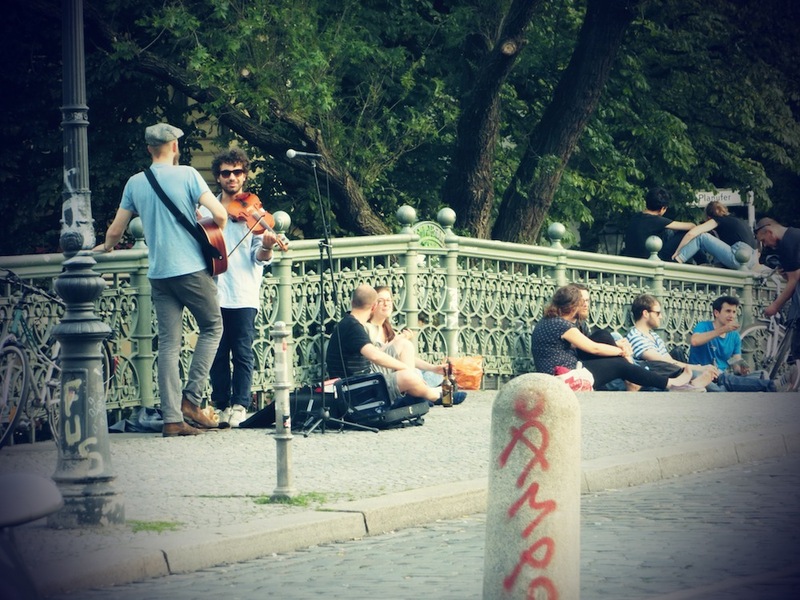 A lady in her late 50s, and myself showed up by the Wenceslas Square, where a young guy with a backpack stood ready with litres of water, under the high noon sun. I found out later that the only other tour signup- Bernadette, was from Tasmania. Nikky, our guide, was from Finland but married to a Czech, and was managing the local tour company in Prague. We couldn’t have gotten a better guide than Nikky. He shared with such fervor the stories of the Velvet Revolution and how Vaclav Havel, a playright and a dissident, clearly an unconventional candidate, became the country’s first democratically elected President for the next 41 years. When Havel died in 2011, thousands of Czechs gathered in Wenceslas Square to mourn a well-loved leader and revolutionary hero. Nikky did not run out of anecdotes given that the Czechs are known for their self-deprecating sense of humor. 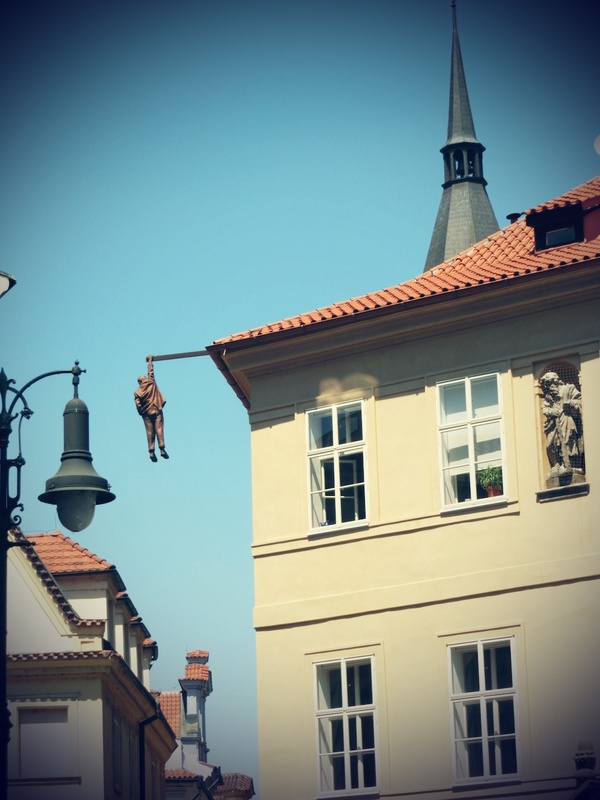 We took the bus to a suburb in Prague 10, and passed a few local cafes and pubs frequented by artists, writers and residents. Hardly any tourists ventured here so the streets were quiet with a few locals having a drink, or late lunch. Along the way, we stopped to look with amusement at some quirky sculptures by David Cerny such as the one of Sigmund Freud hanging by a pole with one hand. He certainly has the Czech humor and wit. Before the tour ended, Nikky tipped me on an underground jazz bar in the Old Town. Later that night, I found the place and rediscovered the magic of jazz as a trio played to a very intimate crowd. 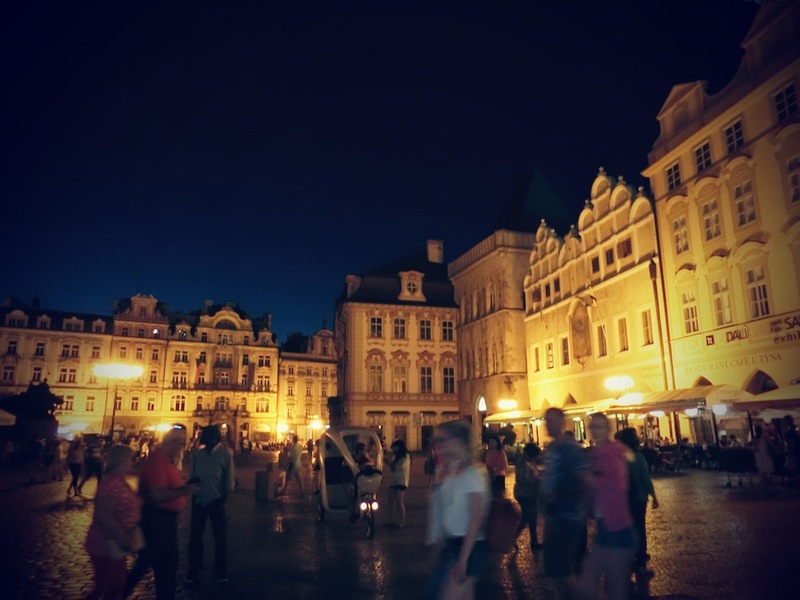 When one mentions Prague, almost always you hear someone say the beer is cheaper than water. This was true inn regular pubs outside the tourist belt where half a liter of light beer can cost 25czk or less than a euro. The Czechs take their beer seriously, with an interesting brewing history that goes back over a thousand years. The first pilsner was produced in Plzn, Bohemia, Czech Republic using traditional methods, and continues to be brewed to this day. We had first tried the Pilsner Urquell in Amsterdam. In this country, drinking beer in the morning will not get you raised eyebrows. It’s no surprise this country is known to have the highest beer consumption per capita in the world. Halfway through our trip, we were now ready for some authentic cucina italiana, or Italian food. One hour flight, and we were in Malpensa Airport in Milan. After almost an hour on the airport shuttle, another half hour on the metro, a ten minute taxi ride and fifteen minute walk, we found our homey little apartment overlooking the Naviglio Grande. 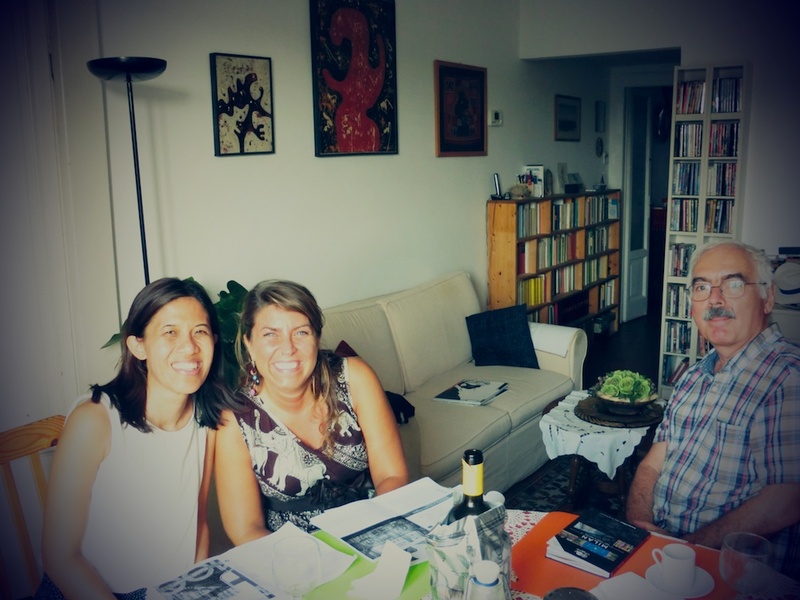 Our Italian host , Bruno, had prepared some insalata di riso (rice salad) and opened a bottle of white wine to welcome us. We found out he used to teach French, and was fluent in English too. He was very eager to talk to us, having just opened his home to guests for a few weeks, and we were most likely his first Asian guests. 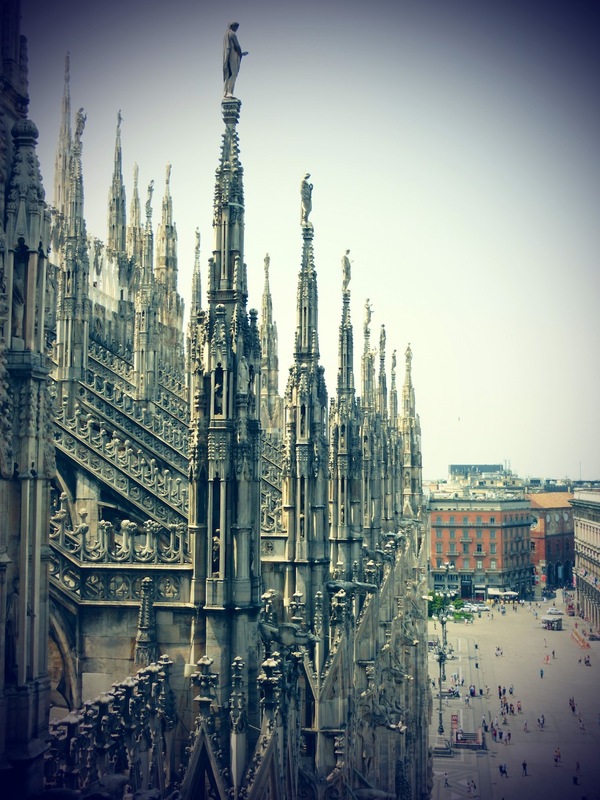 Bruno shared his extensive knowlege on Milan and its old churches, and historical landmarks. An hour later, my friend Selene, an Italian volunteer I met in Dumaguete, joined us. With over 3000 statues, 135 gargoyles and 700 figures, the Duomo is a massive Cathedral, and perhaps Italy’s most impressive Gothic treasure. 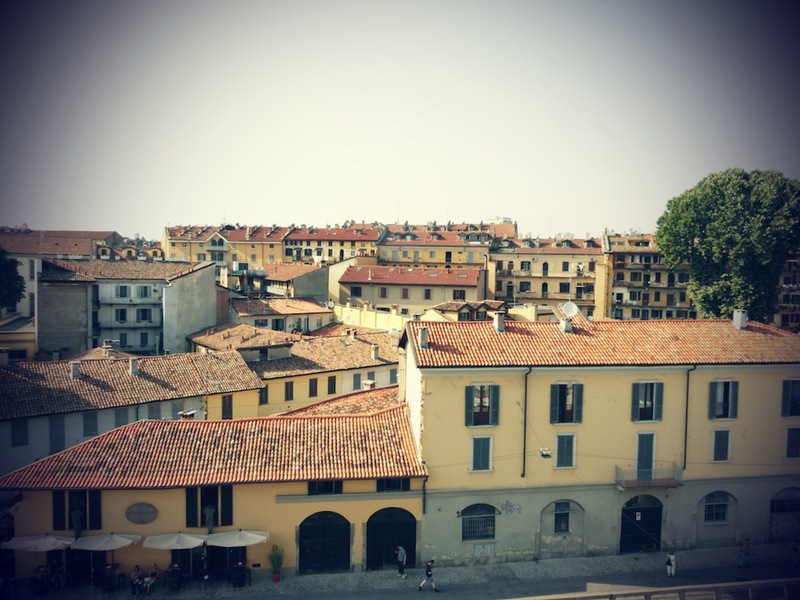 At the rooftop, one can appreciate the spires and gargoyles in detail, and enjoy the stunning view of Milan. Later we took a break from the scorching sun, and found solace in a park, where some families were taking their kids out to play, a couple of young guys were playing some soccer, and several others were also just sitting under the shade, waiting for some breeze. We capped off the afternoon at a cafe for Aperitivo, the Milanese tradition of pre-dinner cocktails complimented by a generous spread of olives and cheese, bruschetta, pizza slices and some pasta dishes, and fruits. 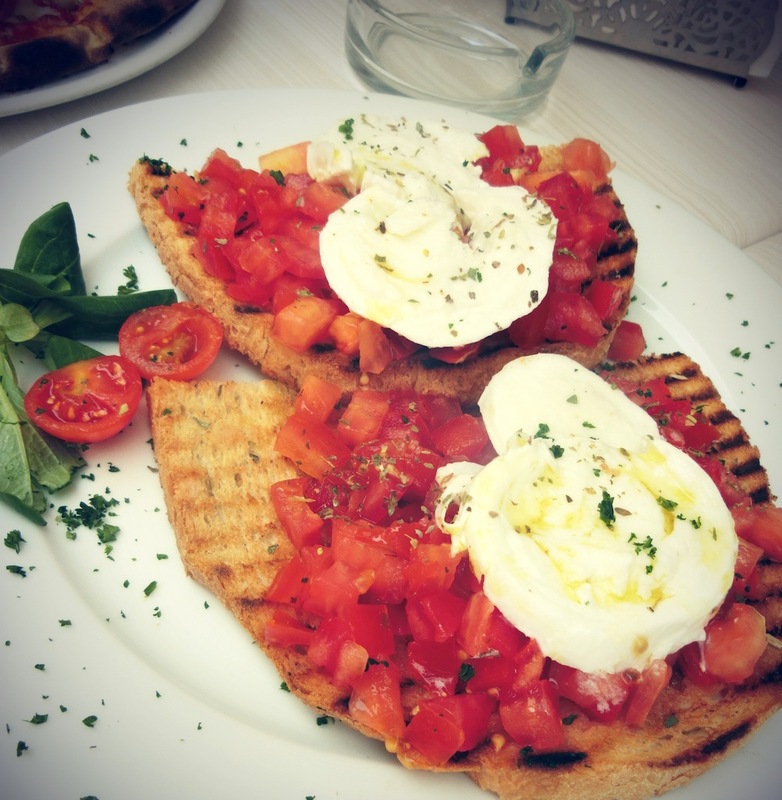 Similar to happy hour, Aperitivo, usually starts around 6pm and lasts until 9pm, and is supposed to tickle one’s appetite for dinner. 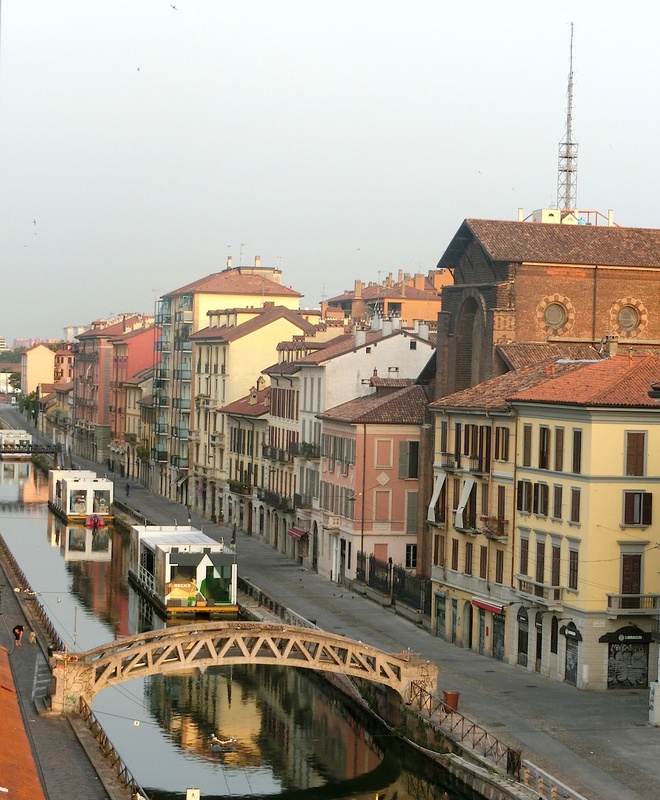 Later that night, we conveniently stepped out from our apartment and walked down the row of restaurants and bars along the trendy Naviglio Grande. At half past ten on a Sunday night, both sides of the canal were filled with locals and tourists dining and drinking, many just leisurely walking from one end to the other. The night was just warming up. I slept during the first hour of the train ride to Rome the next day. 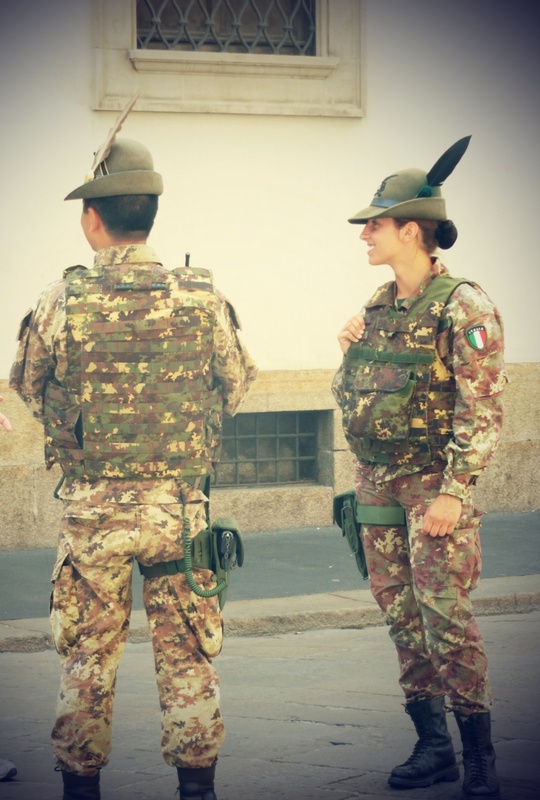 Ann had stayed behind in Milan. With only a handful of passengers in our car, I had the entire window and table to myself. I spent the next two hours reading a book, writing some notes and staring at the vineyards and brick houses. My friend Paola, also a volunteer who had been to Dumaguete a few times, met me at Termini Station. She graciously took me in her apartment, lending me her couch for the next two days. Not wasting any time, and armed with the subway map and tips from Paola and her boyfriend, I began exploring this ancient city of Rome. 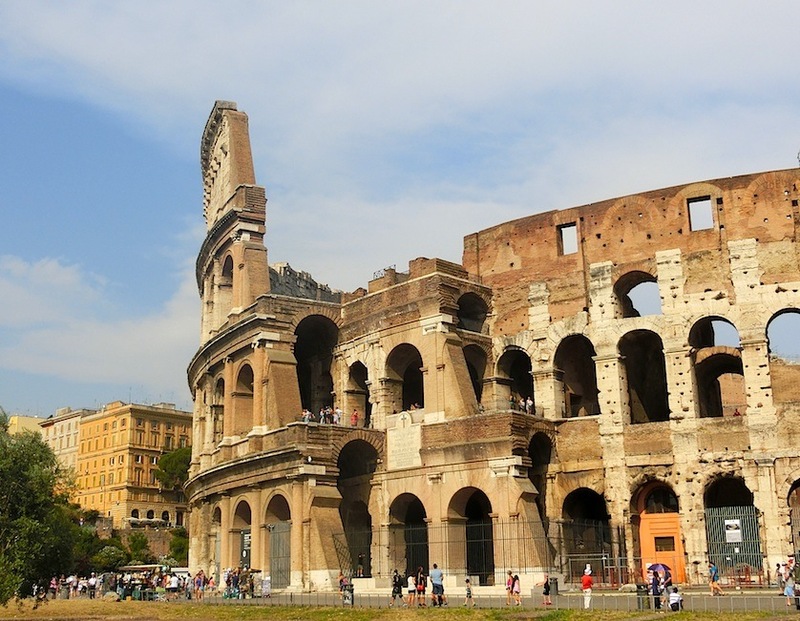 An afternoon was not enough to take in the Colosseum and Palatino Hills but it was all I had. I spent the next day inside the enormous Vatican Museum, Sistine Chapel and the St Peter’s Basilica. Under the searing sun, I must have walked at least 20 blocks stopping by some piazzas and basilicas, lesser known and yet each unique and beautiful. My favorite part of the day however was dinnertime where I had the chance to feast on homecooked Italian food in Paola’s home, and at a cookout in a neighborhood park. 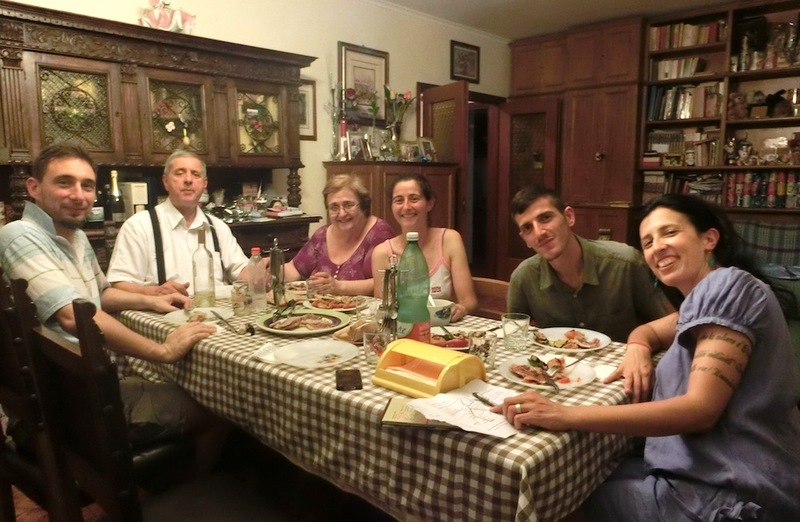 Her mom prepared lasagna that tasted nothing like what we’re used to at home, but had just the right sourness to it, salti in bocca alla romana–ham marinated in wine topped with sage, and some baked tomatoes and zucchini. Dessert of course was 6 different flavors of gelato, with some whipped cream! The next evening we went to a picnic at the basketball court, where everyone brought food. I was in food heaven sampling so many Italian dishes, all homecooked. It couldn’t get more authentic than that! With a week left, we had one more country to discover, and in hindsight, I think we saved the best for last. I met up with Ann in Madrid during a quick layover, before flying together to Pamplona. We arrived Pamplona right in the middle of San Fermin fiesta, a 9-day festival known for the Encierros or the running of the bulls. It’s amazing how the entire city turns into a sea of white and red as literally everyone, tourists and locals, old and young, uniformly dress in all white, with a red scarf around their necks, and a red waistband. We had booked ahead for a balcony to watch the bullrun, which came at a painfully steep price. My only consolation was when my Spanish friends reminded me there was nowhere else in the world where you could witness thousands of men try to outrun the bulls. As early as 5 in the morning, we were up to make it in time to Plaza del Castillo before the roads were closed at 7. 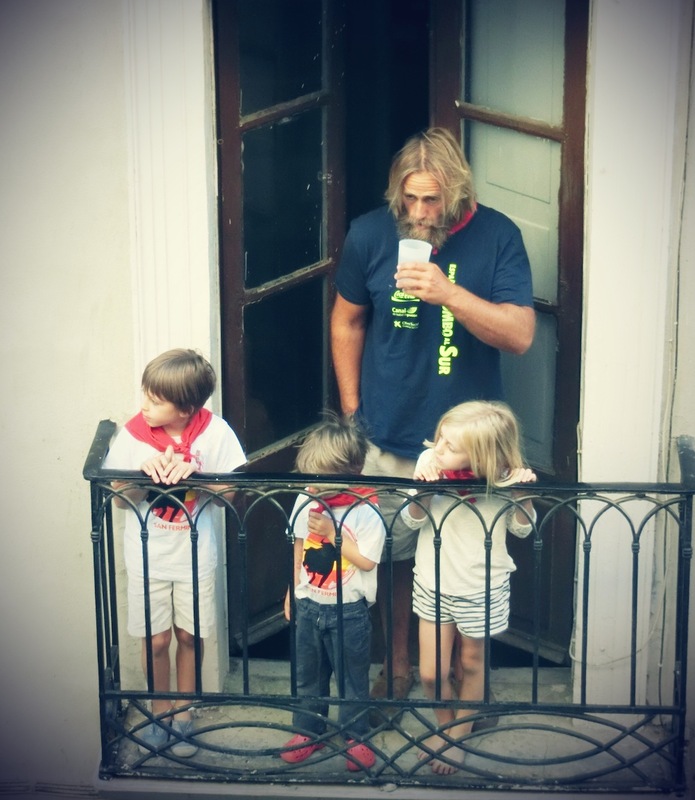 From the balcony overlooking Calle Estafeta, the longest section of the bullrun, we could see the men starting to stir excitedly and nervously. Some guys were obviously pumped up from the past night’s (or early morning) partying. The first rocket was fired at 8AM, signaling the corral gate had been opened. Shortly after, the second rocket went off alerting the runners that the bulls were out. Some men started walking briskly, others jumping and looking back to spot any bulls. Soon, the entire crowd started to run and shout, as the six bulls come charging down the street. Some men stumbled and rolled to the side, with hands over their heads. The bulls kept running, as some brave runners, probably still inebriated, quickly touched the bulls, others flicking the newspaper roll they’re holding at the bulls. Soon the steers were running down the same street. Seconds later, the third rocket was fired signaling the bulls are now in the bullring. At the fourth and final rocket, we knew the bullrun had ended. It lasted under four minutes. We went back inside the house, and watched the replay of the bullrun on TV, while getting food from the breakfast spread prepared by the owner of the house. From the TV coverage, we learned one guy was taken on a stretcher, but no one was gored that day. The rest of the morning was quiet as almost everyone had probably gone back to bed after a night of partying that lasted well into the morning for the bullrun. We decided to walk around, and found ourselves joining a crowd outside a church. Moments later, a parade of towering figures with oversized heads slowly came out, with a band. This was the traditional parade of the Gigantes y Cabezudos , which usually follows the bullrun. 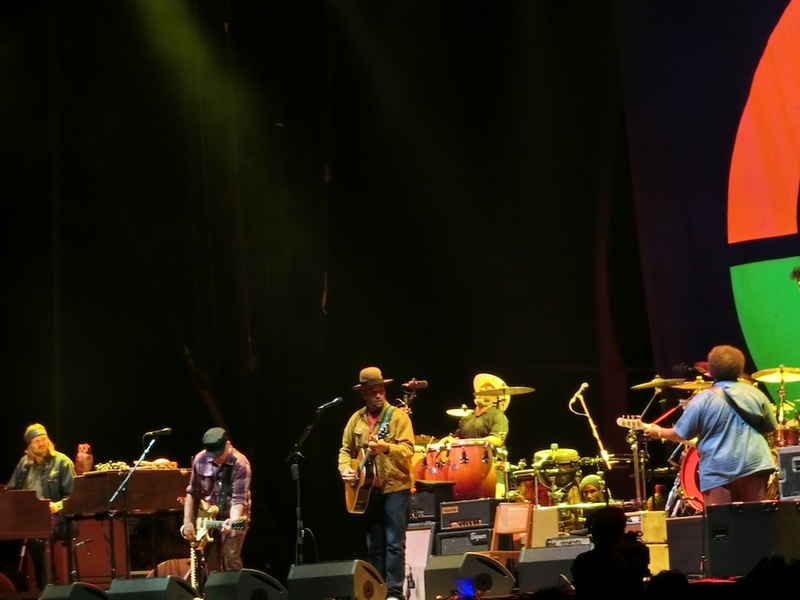 The first ‘giant’ playfully bumped some of us in the crowd. 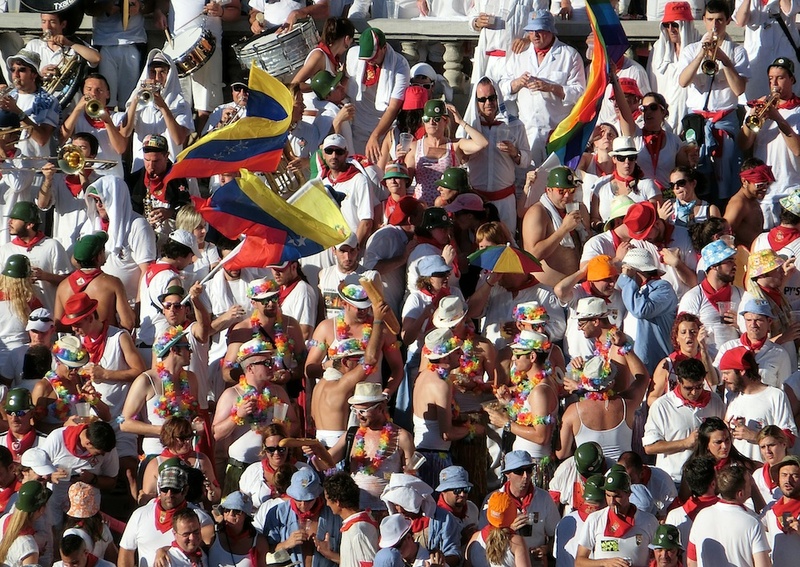 The mood of the parade was clearly playful and as festive as the Sanfermines. 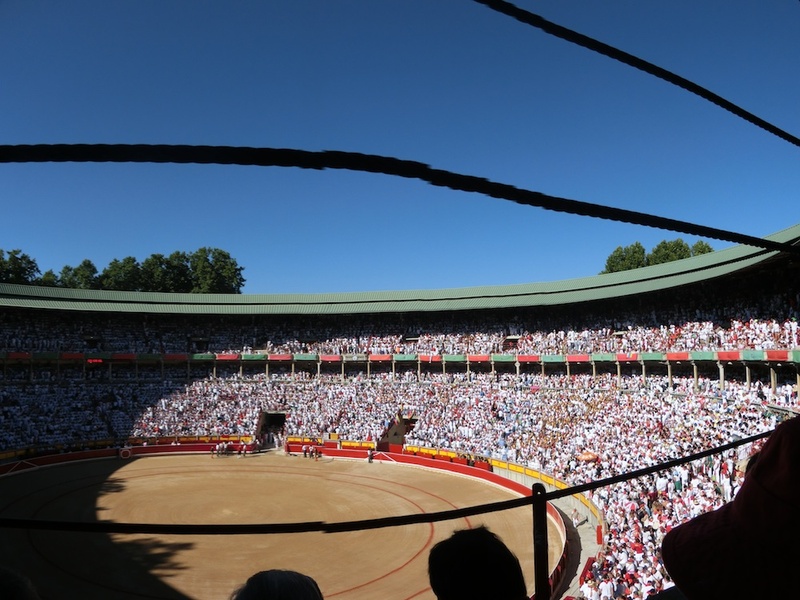 Later that afternoon, we joined thousands of spectators at the Plaza de Toros to watch the bullfight. Six matadors, each with his own technique, entertained the huge crowd. 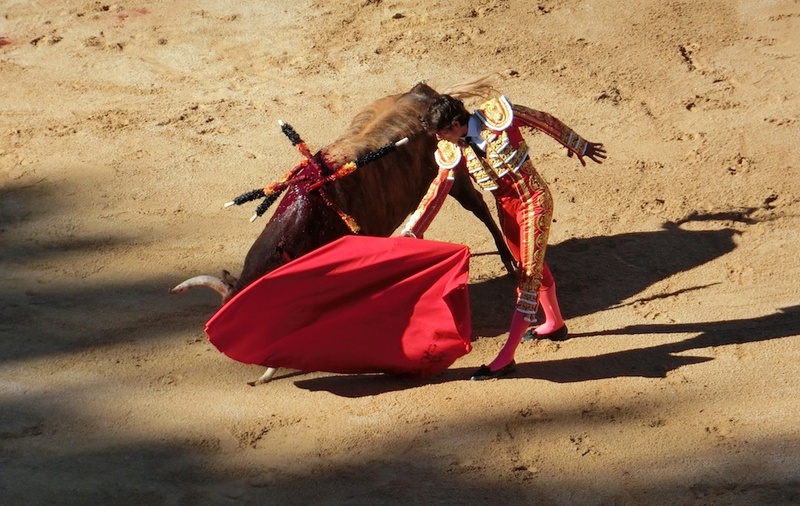 It’s a show of courage and grace,almost like a dance, as the matador tries to skillfully and gracefully work the bull. It was as exciting for me to watch a bullfight for the first time, as it was to be part of the packed arena of revelers in high spirits! Outside, the party was just getting started on the streets, the bars and plazas. 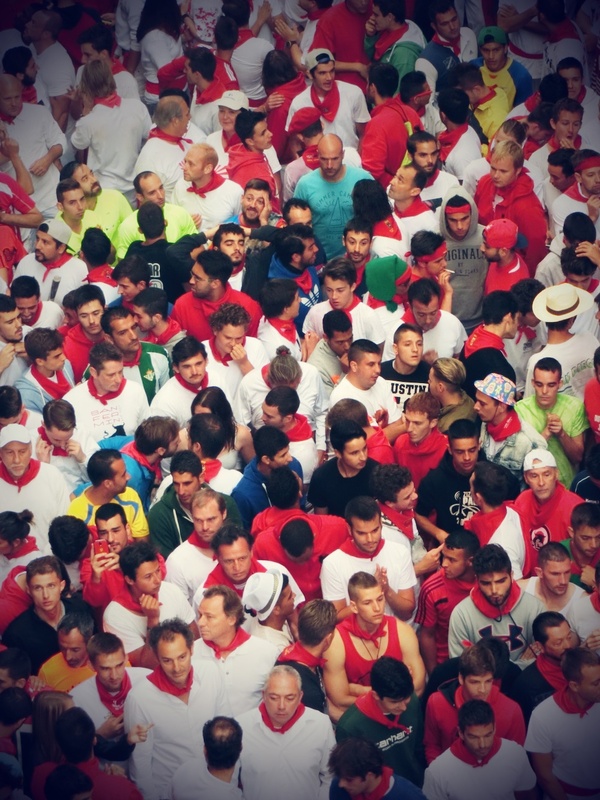 The next morning, as we boarded the bus for Vitoria, we saw a couple of guys clad in the San Fermin uniform, all merry and inebriated, and ready to sleep through the ride. 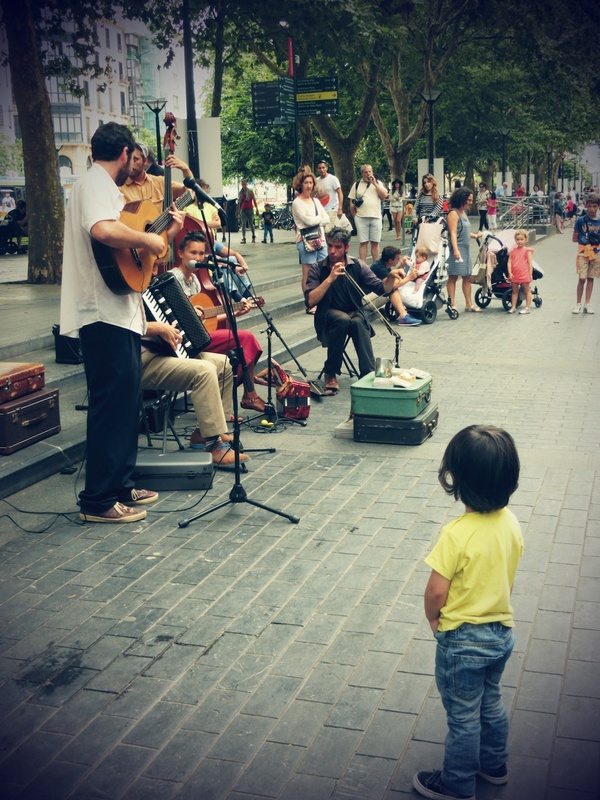 Bilbao Musicfest Summer in Europe for me was all about live music everywhere. In a park in Amsterdam, on a bridge in Berlin, in a secluded jazz bar in Prague, on a sidewalk in San Sebastian, around a plaza in Pamplona. Each occasion, whether scheduled or spontaneous, I savored every beat and song, even if the words were foreign to me. 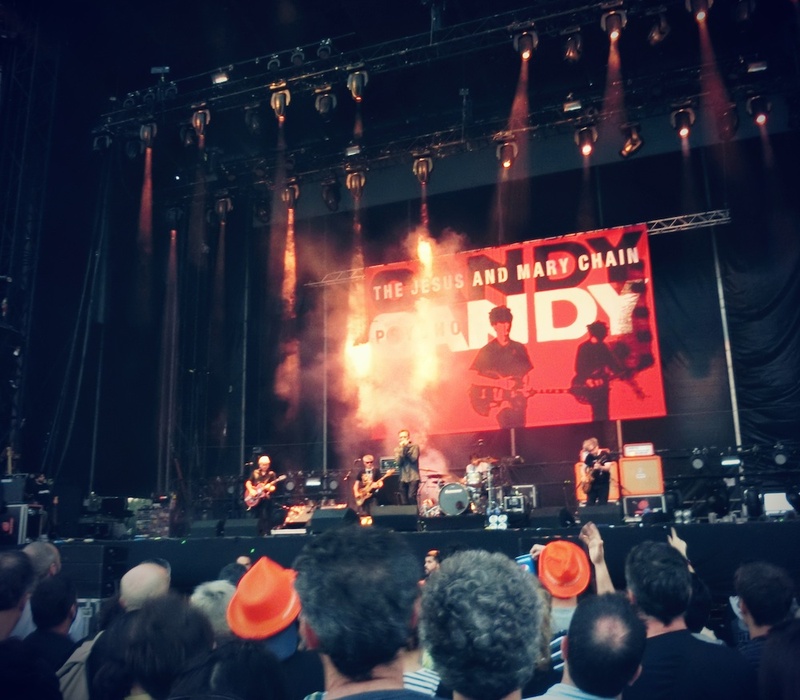 My indulgence reached its climax when we went to the Bilbao BBK Live, a massive open air music festival held annually that attracts thousands of music fans around Europe. We went to the musicfest with Jorge and Oscar, whom I had met in Dumaguete. Jorge booked a van to drive us and his other friends who came from Madrid, to the concert grounds perched on a hill on Kobetamendi, where we were greeted with a panoramic view of the city of Bilbao. Our van driver, Pepe agreed to take us back to Vitoria at four in the morning. 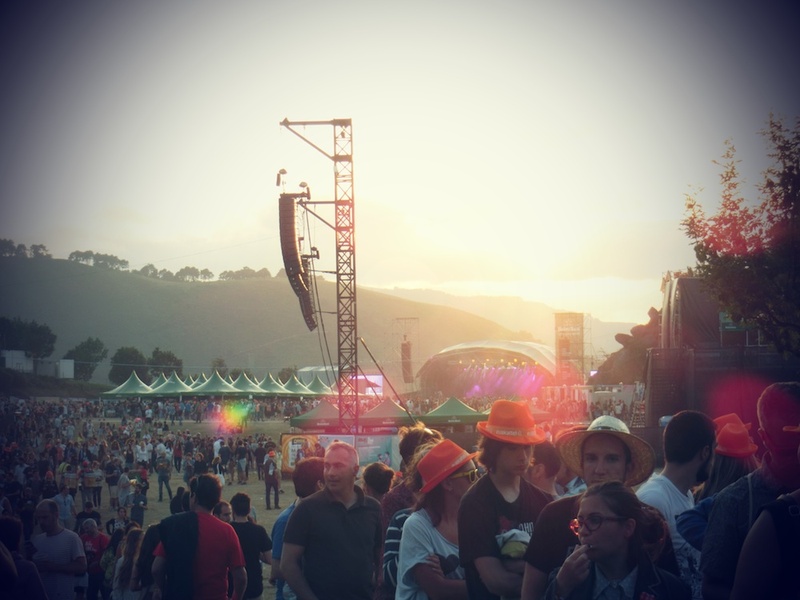 It was an outrageously fun night for all, with just the right Basque weather, two huge stages and two indoor stages, beer counters and food trucks, and the infectious energy from the festival fans. From the punk rock music of The Jesus and Mary Chain, to Ben Harper’s blues and reggae beats, to the solid 2-man band London Soul’s classic rock and roll and Azealia’s hip-hop music, it was an unforgettable night of singing, jumping, dancing, rocking, and drinking! 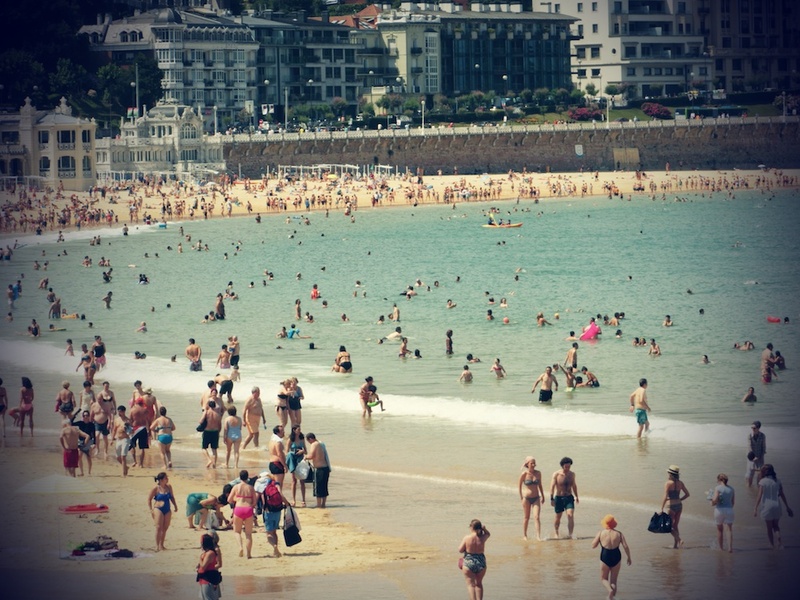 After successive nights of partying at BBK Live and San Fermin, we drove up to San Sebastian, in the northern part of Basque, near the southwest border of France, which was the perfect place to take it easy. This picturesque seaside town is known for the best pintxos so we wasted no time and went pintxos bar-hopping right away. Each bar had a counter filled with plates of different pintxos to choose from. 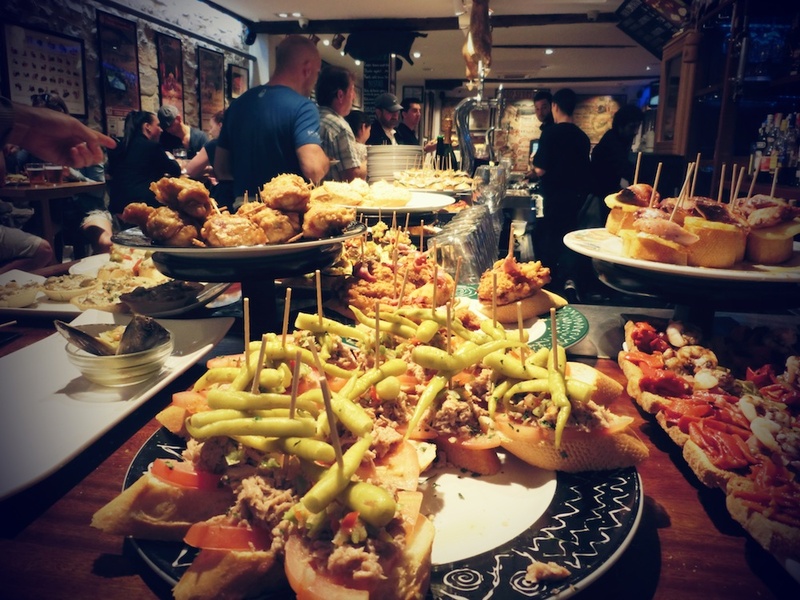 We went to a traditional pintxo bar and tried the classic Gilda- skewered olives, chili peppers and anchovies in olive oil, and the shrimp with garlic oil. Around the corner, they served more innovative pintxos such as crab ice cream and the mini wagyu burger. It was amazing to see how each type of pintxo was a work of art, and a gastronomic treat! We must have tried at least seven different kinds, paired with a few glasses of txakoli, white wine from the Basque region. I spent the next afternoon at La Concha, rented an SUP board, and paddled away from the packed beach. It was a sunny, flat day, and I had the best view of the promenade, the beachfront houses and the beautiful bay. Rented an SUP and paddled here at La Playa dela Concha. Our final stop was Barcelona, a city that sizzled in the summer heat and warmth of the locals and growing number of immigrants. 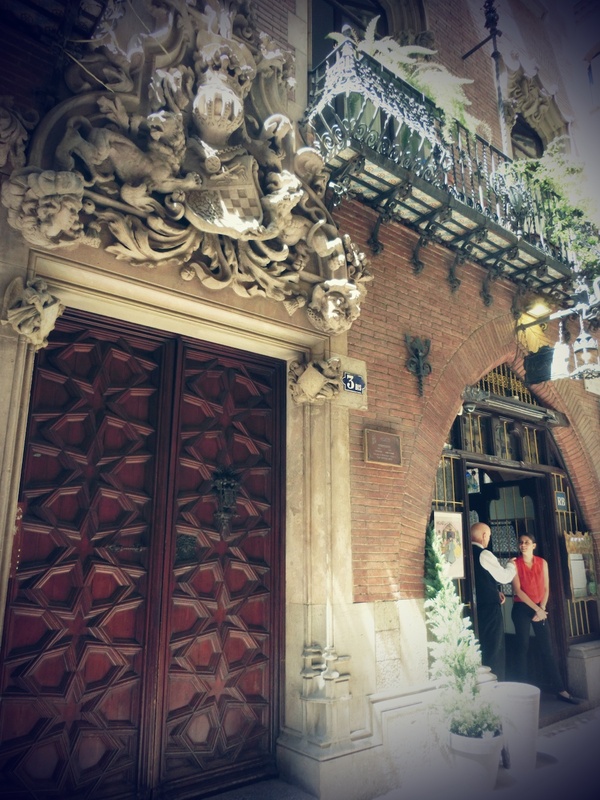 With our bags in tow, we walked right in the middle of crowded Las Ramblas to our final apartment in the Gothic quarter. An unwelcome surprise was finding out our room was on the 4th floor of a building that had no lift, and the stairway was a narrow, winding one. 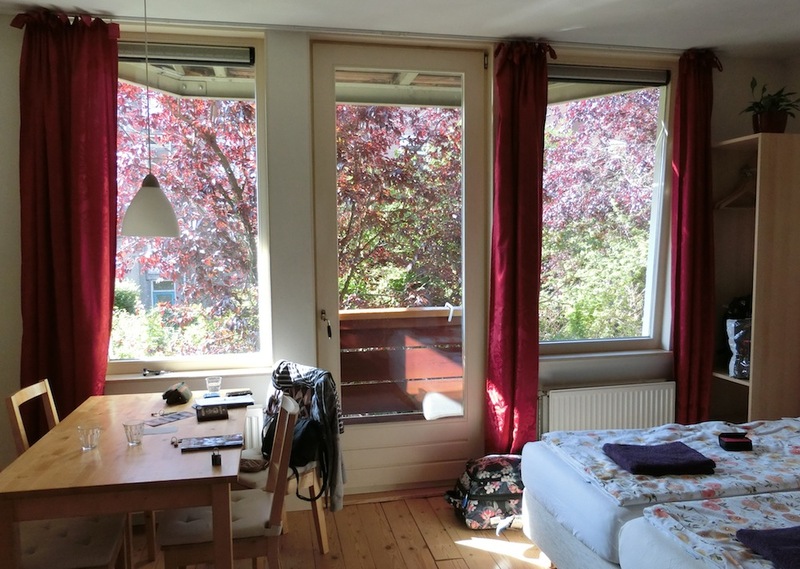 Recalling the impossibly narrow staircases in Amsterdam, we sensed an ironic pattern here. Save for this minor inconvenience, the area was less than a block from Las Ramblas, even closer to the Plaza Reial, and some cool vintage shops. El Qatre de Gats where Gaudi and Picasso met with friends and co artists. 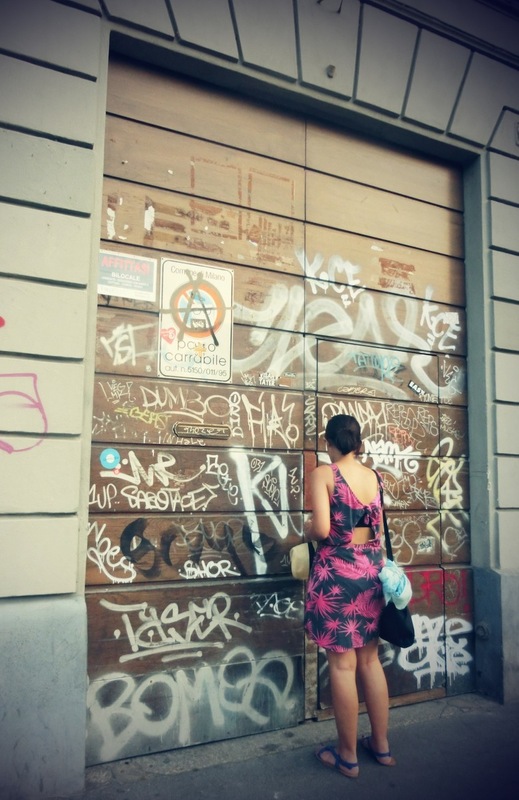 I walked for the next two days, exploring and getting lost in the sidestreets and plazas. By now, getting lost was second nature to me. I just had to find something interesting everytime I realized I was nowhere near to where I had planned to go. 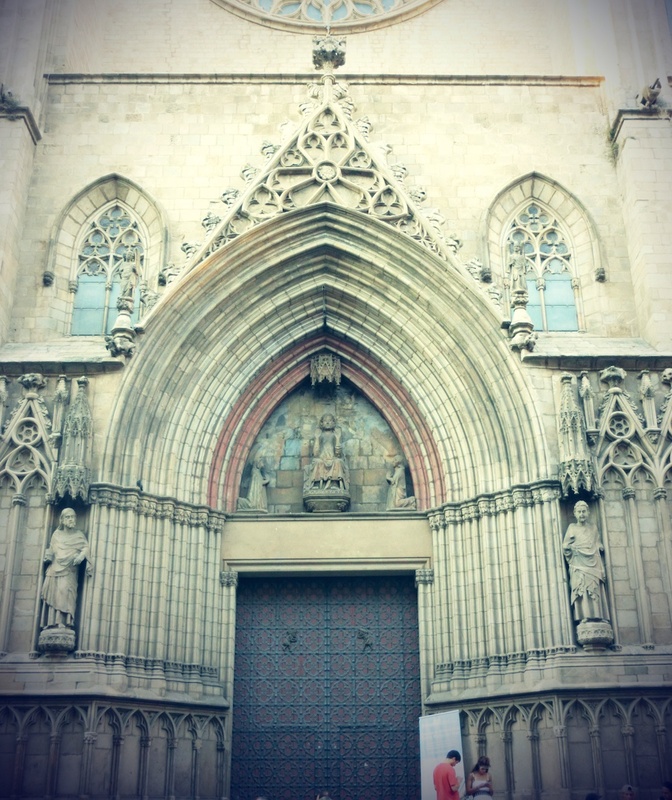 On our last day, while my friend took a bus tour around the city, I wandered the streets in La Ribeira and Barri Gotic, and discovered some Gothic-Catalan churches such as the beautiful Santa Maria del Mar. After almost an hour of walking in the wrong direction, I finally found the century-old restaurant El Qatre de Gats, a homey restaurant in a Modernist building. 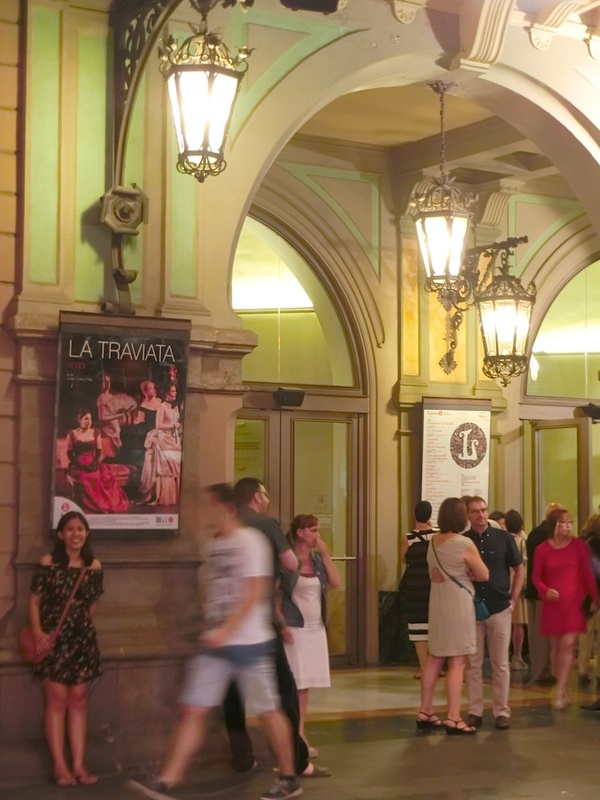 4Gats has its interesting beginnings, having been a cultural venue and popular hangout of artists like Picasso and Gaudi. Later that night, we randomly checked out a bar in Plaza Reial and watched flamenco dancers perform to live guitar music. It was almost hypnotic to watch the expressive movements, the intricate footwork and the intense facial expression accompanied by the equally passionate guitar music and emotional singing. 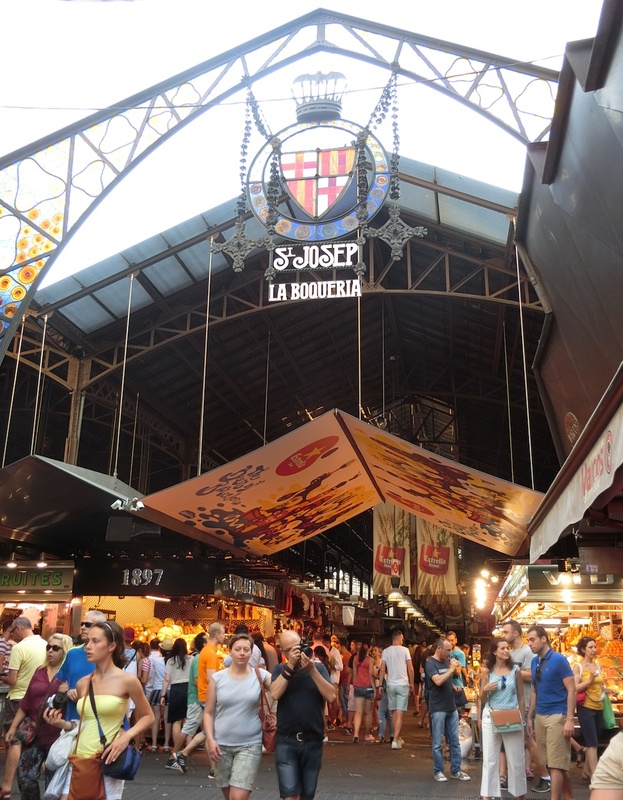 Barcelona, with its fascinating architecture, alluring locals, vibrant art scene, and tasty tapas, was a sensuous finale to my 20 days of summer in Europe. 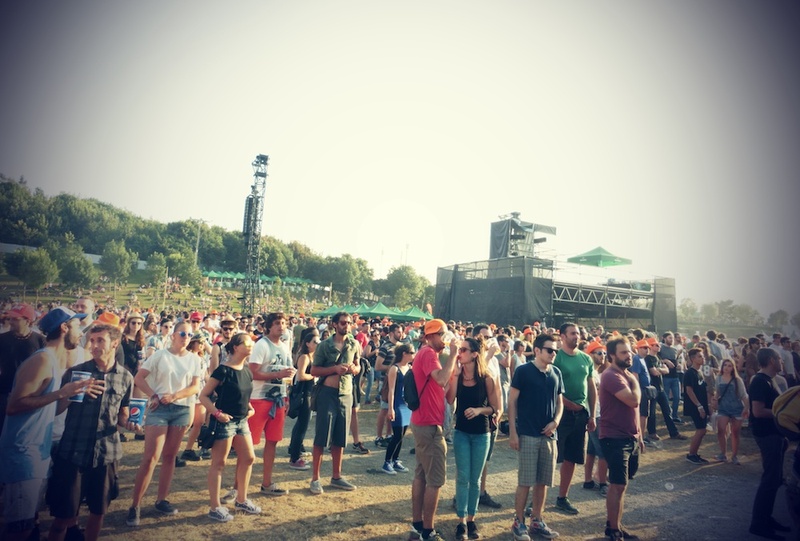 This entry was posted in adventure, music festival, travel and tagged amsterdam, bbk live, berlin, europe, milan, prague, rome, san fermin, san sebastian. Bookmark the permalink.